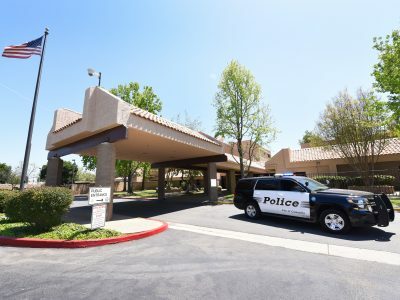 Law enforcement services for the City of Camarillo have been provided on a contract basis by the Ventura County Sheriff’s Office since the city’s incorporation in 1964. At that time the city encompassed approximately 5.5 square miles and had just under 10,000 residents. During the first years of service, patrol officers worked out of the Sheriff’s main station in Ventura. The first Camarillo police station opened in June 1966 in the elementary school facility located near the intersection of Ventura Boulevard and Elm Street. A nine-man police force worked out of the elementary school until 1977 when the police department was moved to the former City Hall building on Palm Drive. The officers patrolled the city on a 24-hour basis in two 1-person patrol cars. In 1995, the Camarillo Police Department moved to its current location at 3701 E. Las Posas Road. The city now encompasses 20 square miles, has a population of more than 66,000, and has a sworn force of 55. Besides patrol officers, the Police Department has a youth officer, four school resource officers, a crime prevention officer, eight traffic officers, six detectives, five special enforcement deputies (SED), a Community Resource sergeant, and a Homeless Intervention officer. The Camarillo Station is also home to the deputies that patrol the unincorporated areas in and around Camarillo. The twenty-one sworn members assigned to the County area are responsible for responding to calls for service in a 136 square mile area, from Somis to Malibu. Volunteer programs include the Citizen Patrol, Explorer Program and the Disaster Assistance Response Team (D.A.R.T.). These programs volunteer thousands of hours every year ensuring that the public remains an integral part of all of our services.